It's been a nonstop year-and-a-half for Complicated Animals, ever since the indie pop fusion duo moved to California to pursue music together. Monica da Silva and Chad Alger have played at venues up and down and across the state, da Silva told the Sun on the way to a gig in Pismo Beach in late November. The two were driving like they always do to their shows, with their dogs Ju Ju and Penny Lane along with them, heading north. Their upcoming concert, on Dec. 7 at Naughty Oak Brewing Co. in Orcutt, was on their way "playing back" to their LA-area home after shows in the Bay Area, she explained. "We're kind of doing a lot of back-and-forth stuff," da Silva said. 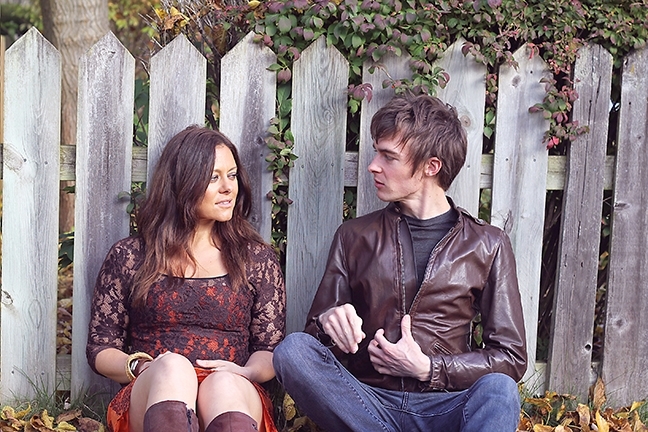 Monica da Silva and Chad Alger released the album In This Game in 2015 (album photo pictured), stating their love of Midwestern indie pop sounds while blending in da Silva’s background with jazzy, bossa nova-inspired originals written in Portuguese, French, and Spanish. For da Silva, back-and-forth traveling has always been a part of her life. Her father was American and her mother was Brazilian, she explained, and so she grew up in the Midwest, visiting Brazil each year with her mother. There were lots of musicians in the family, she explained, and she sang and studied piano and flute. She played in a family band and was also raised listening to the bossa nova kings from her mother's youth. "A lot of the '60s bossa nova, I feel like I was really influenced by that and I've always been really drawn to that," da Silva said. "It feels very organic to me and natural and very laid-back and simple. ... It just makes sense. It's pretty relaxing and puts you in a good vibe or mood." For Alger, who grew up in a musical family in the Midwest as well, Latin music forms like the bossa nova were one of many he studied as a drummer. Like da Silva, he was raised listening to and studying a wide variety of music, from folk and blues music to the Midwestern indie rock and pop that characterized the area. "We both love listening to all different genres and kind of taking a little from everything," he said. "It's not like we intentionally do that, but I think we absorb different things and kind of refine them in different ways." Complicated Animals performs live on Dec. 7 from 5:30 to 9 p.m. at Naughty Oak Brewing Company, 165 S. Broadway, suite 102, Orcutt. More information is available at naughtyoak.com or socialitefiascomusic.com/complicatedanimals. The couple met in Chicago and played in a four-piece band before writing songs together and becoming a duo project. They released their first album, In This Game, in 2015, and have a newer single out that was released in January. The album and the single demonstrate da Silva and Alger's affinity for indie pop, a style with roots in European post-punk that prizes pop-influenced melodies and more danceable and approachable songs than the heavier indie rock styles. Indie pop also combines rock and pop with folk music and blues traditions and may use "found" or DIY instruments like toy pianos or others. The pair take that melting pot approach to their music. "I think just being self-produced and combining different things, that's what it's about," Alger said. With da Silva's own melting pot background, Complicated Animals' sound is really something unto itself. They've dubbed it "indie nova," to represent their indie roots with the bossa nova influence. Some of their jazzier originals, which da Silva wrote lyrics for in Portuguese, French, and Spanish, illustrate the "nova" part of their sound. Alger's chords are percussive, while da Silva plays high riffing flute lines that counterpoint the vocal melody she sang earlier. Those songs almost evoke a lost age, like when swing jazz ruled Europe, and musicians like Django Reinhardt and Ella Fitzgerald walked the Earth. Complicated Animals are touring California with their self-described “indie nova” music, a fusion of indie pop and Brazilian bossa nova, and will stop for a Dec. 7 show at Naughty Oak Brewing Co. in Orcutt. But other songs don't call that far back for inspiration. Their latest single, "Show Me," has a strong 1980s sound, a focus that was more than intentional, da Silva said. The number is complete with fuzzy synthesizers, a strong beat, and dreamy harmonies during the chorus. There's a variety to the duo's sound, da Silva admitted, but that's only because that's how she and Alger are musically. "I think it's cool to know a bit of everything and be exposed to so many different things and just see where it takes you," she said. "I think both of us, we love hearing new stuff and we're always searching for new stuff to listen to. And each thing we listen to will inevitably influence us as to what we're writing at the moment, I think." That's partly the inspiration for their band name, da Silva explained, as both artists bring their entire, complicated background to the stage when they perform. The other part is that they bring their animals, Ju Ju and Penny Lane, along with them on tour, too. After the Dec. 7 show at Naughty Oak, da Silva and Alger will play their way back home again, but they'll be back on the road soon, they said. And any fans they pick up in town should know that Complicated Animals is planning an album release in 2019. "We've written so many songs, and we haven't had as much time as we'd like to record because we play shows all the time," da Silva said. "Since we got [to California] we've been pretty much touring nonstop and trying to grow our following. "It's been really cool," she added. "Every time we play somewhere it will lead to more shows." Managing Editor Joe Payne hopes more bands stop by on their way through. Contact him at jpayne@santamariasun.com.